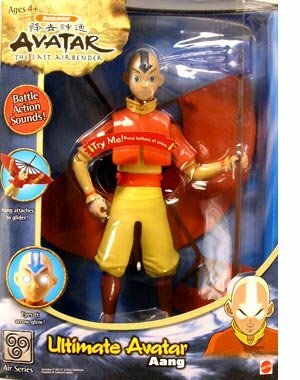 As nicely as getting a skilled Airbender, when faced with extreme situations, Aang also has the ability to call upon the Avatar Spirit, which enables him to become tremendously powerful. Includes Glider, staff and 3"AG13"(LR44) batteries. Measures 10 ". Whilst in this state, his tattoo and eyes light-up, and his airbending abilities increase. 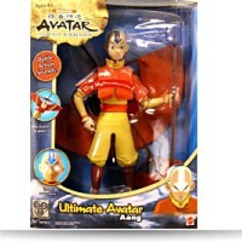 Aang attaches to glider and his eyes and arrow glow. Product Dim. : Height: 12.1" Length: 3.1" Width: 9"
Package: Height: 3" Length: 12" Width: 9"